London Luton Airport (LLA), one of the UK’s largest airports, is undergoing a major digital signage overhaul, which will eventually see up to 400 indoor displays replaced over the next few months. The move comes as part of the 80-year old airport’s £160 million transformation program, which also includes a terminal extension and new retail area, increasing the need and opportunities to display information to customers. The airport, which is forecast to see passenger numbers passing through its terminal rise from 15.8 million last year to a capacity of 18 million by 2020, uses displays to provide a mix of flight/passenger information, commercial (advertising) and also (away from passengers) its back office Operations Centre. 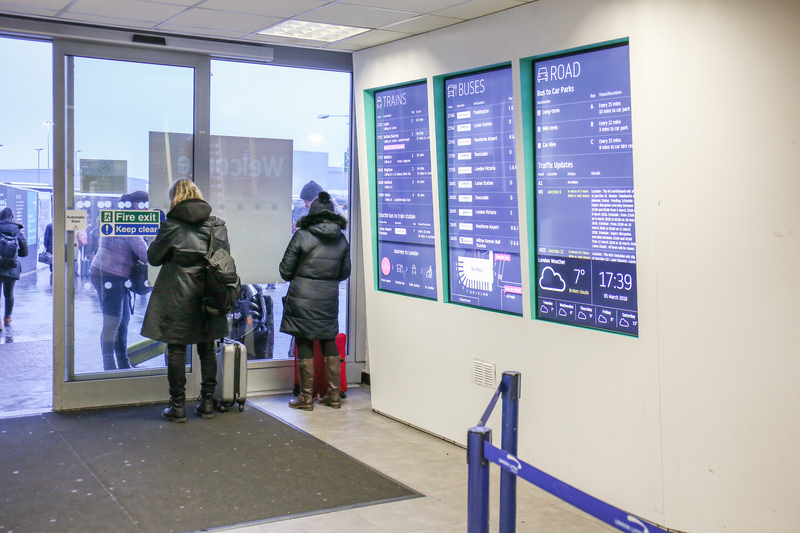 According to the airport’s long serving AV partner SPC Group (who has also handled Cardiff airport’s displays for 12 years), the displays have been strategically placed to provide passengers with crucial details required during their journey, which begins the second they enter the airport. Details such as (amongst others) directions to toilets, check-in, gates, flight status, distance and travel time to the gate – all accessible from wherever they happen to be, 24/7. “From the moment they [passengers] arrive, they need that nice passenger experience to keep them comfortable. Many people arrive a bit nervous and anxious. They’re not always certain what time their flight will go, worried about your bags being on the same flight as yours, do the have their passport, where are the toilets and of course, many people don’t like to fly – all those things play a part. “If we can make sure we’re giving them all the correct information all the time it improves the passenger experience,” SPC Group MD, Jon Swain. As part of the upgrade, all displays in the airport will be switched to LG. Swain explained the airport chose LG based on their level of reliability (less than a one per cent failure rate). Swain explained: “We found that the LG’s were considerably more reliable, with displays having a less than one per cent failure rate. The screens will go in and last five years. After five years of 24/7-usage in a harsh environment (dust, hands, vibrations from flights), they’re on their last legs. The airport’s expansion began a year ago, with the tender process beginning in May last year, with SPC being awarded the contract in October, beating a shortlist of five other companies. Of the 400 displays, all of which will be replaced to LG within the next “couple of months”, 122 are evident immediately at the 61 check-in desks as you enter the airport. Each check-in desk includes two displays (side-by-side), with one providing advertising, while the other features check-in information. The existing check-in desk screens have been replaced with 124 LG 43” 43SM5KD monitors, providing what it claims to be better colour definition and wider viewing angles. As passengers move through the terminal to the security search area, LG 49” SM5KD displays are placed throughout walkways to guide and provide way finding and flight information. A large 3 x 3 LG 55” LV75A video wall has been installed as passengers leave the security area, which relays adverts of airport retailers and further flight information before they enter the retail area. 10 LG SM5KD displays are positioned along the escalators, in a prime location for external advertising, sold to third parties as part of its digital signage estate. Swain explained that a key part of the transformation at the airport is the new retail area, which houses 30 new shops and restaurants including Ted Baker, Next, Oriel Brasserie and Oliver Bonas. LLA has also increased the number of flights and destinations it has to offer, with the addition of eight new boarding gates. Each gate has four LG 34” 34UM68 monitors, which are hung from the ceiling in back-to-back formations to ensure visibility in the walkways from two directions. 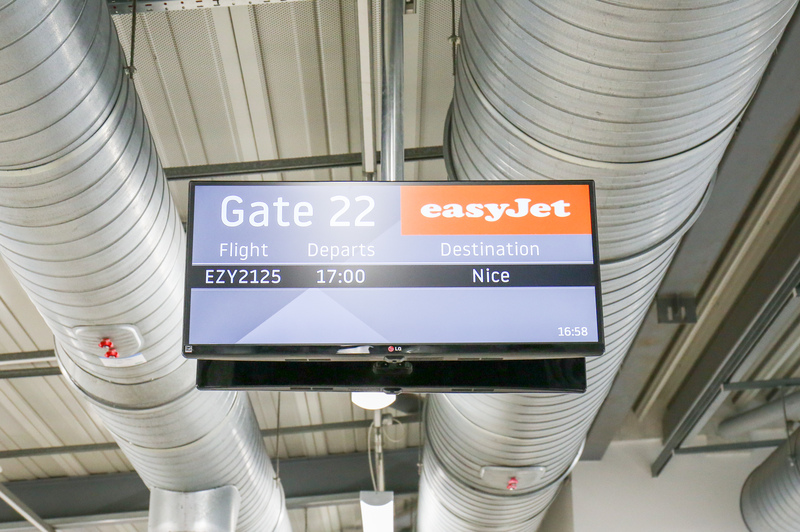 The ultra wide monitors can be used as split screens, featuring the destination and flight number on the left and information about the end location on the right, such as weather, as an extra customer service element. Travellers arriving into the baggage reclaim hall are greeted with two LG 55” 55LV75A videos walls in a 3 x 2 and 2 x 2 back to back formation, built into a custom made frame by SPC Group. LLA also provide onward travel information in real-time via a configuration of three LG 65” SM5KD displays, at various locations, in a portrait formation.